This post was written for inclusion in the monthly Carnival of Natural Parenting hosted by Code Name: Mama and Hobo Mama. This month our participants have talked about how they continue learning throughout life and inspire their children to do the same. Although I graduated nearly 15 years ago, my education is not finished. 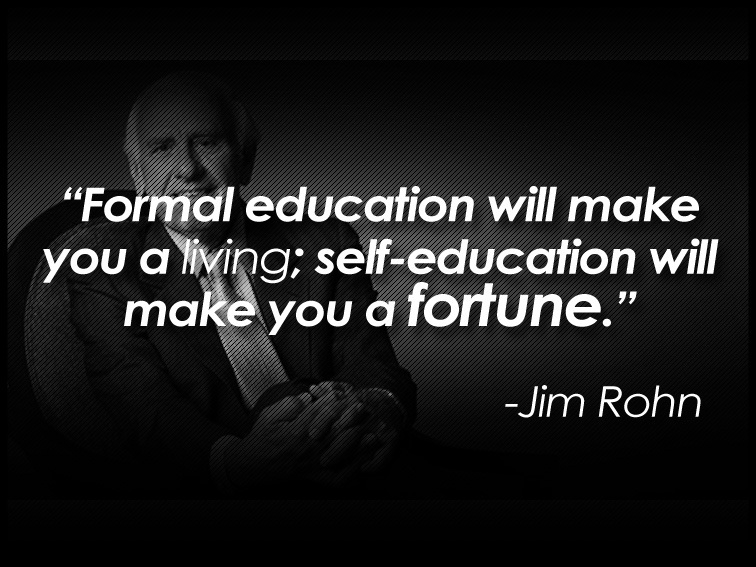 In fact, I would say that I’ve learned more since finishing formal schooling than I ever did in school. My husband never had the opportunity to attend school for any length of time, so nearly all his knowledge, which is considerable, has been self-taught. The idea of life-long learning is an important concept for our family. For a time, I ran my own online business selling children’s organic and homemade items. There was so much to learn. Things like product presentation, taxes, establishing a customer base, web design, networking, marketing, and Ebay were not new to me in theory, but in practice…well that’s a whole different story. What I didn’t realize at the time is that the things I learned in the 18 months or so that I ran my hobby business were just a taste of things to come. Like kindergarten to the business world. I closed my business when we made the move to Mexico, 9 years ago. Since then, we have “failed” at a number of businesses here. Although for the most part, they were not profitable monetarily, we did learn quite a bit in the process and therefore, don’t consider these ventures a waste of time. The businesses we have failed at include a produce truck, taco stand, clothing store, bread baking endeavor, tire repair shop, bricklaying, ranching, farming, gardening, essay writing, and blogging to name a few. Currently, my husband and I have steady employment, part-time employees, part-time owners. I run my own Saturday school and afternoon tutoring sessions but also work for a private elementary school during the week. My husband maintains our mini-ranch and sharecropping endeavors in the mornings and is the maintenance man for the same school in the afternoons. Being gainfully employed doesn’t mean that we’ve stopped looking for ways to expand our knowledge base. Recently I was asked to write essays for a Business English course. (See Failing at your own business–University courses) Not only did it pay well, but I learned quite a bit about Business English which I have now incorporated into my Saturday classes, teaching interested students how to write memos and other office documents. My husband was also offered a part-time position at a liquor store. He comes home eager to share what he learned about types of alcohol, inventory processes, and delivery systems. 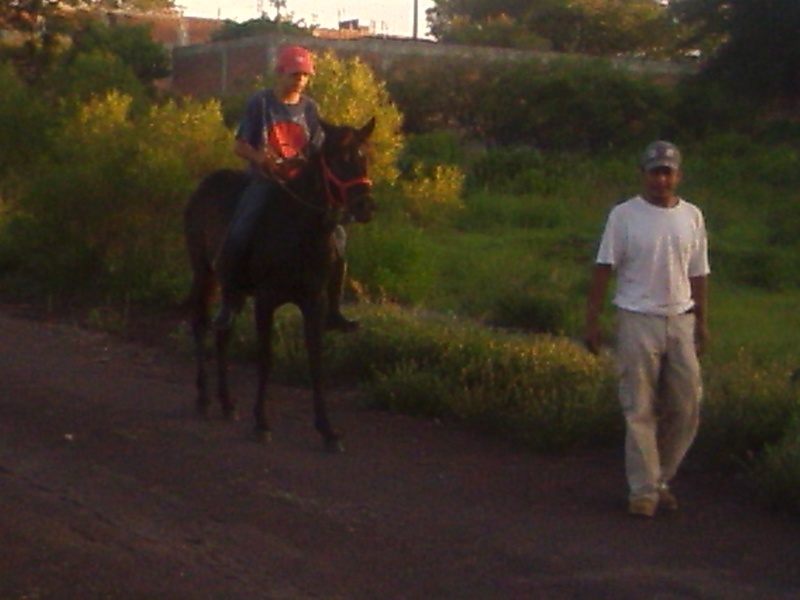 Besides learning how to make a living, I’ve had to learn how to navigate a different culture since moving to Mexico. 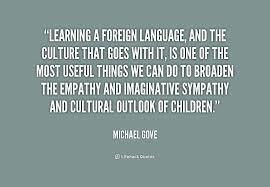 This includes not only learning new vocabulary but also learning how things are done. I know that I’m far from proficient, but I think I’ve made some progress. I accredit my minuscule advancement to my willingness to make a lot of mistakes and ask endless questions. Who would have thought I’d have to relearn how to bury a person (See Mass and Burial–Mexican Style) or how to shop for groceries? How about learning how to wash clothes in the stream? 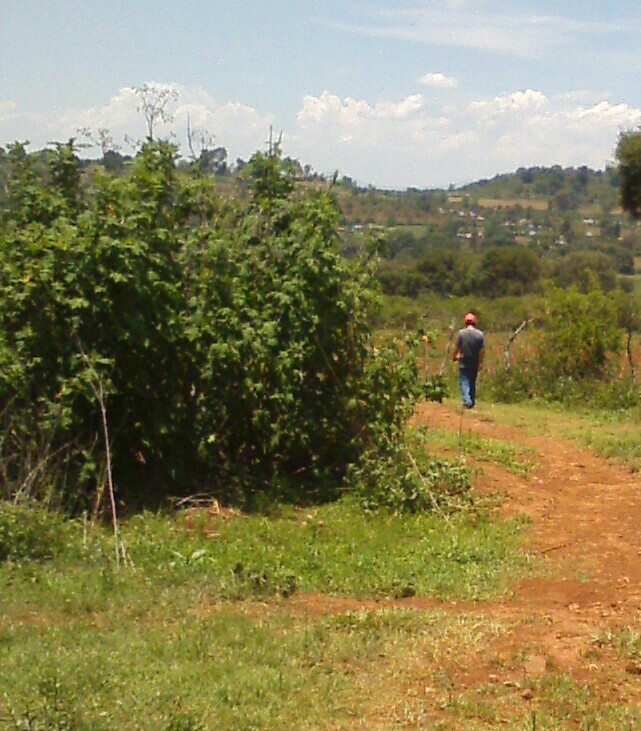 Or how to buy land? 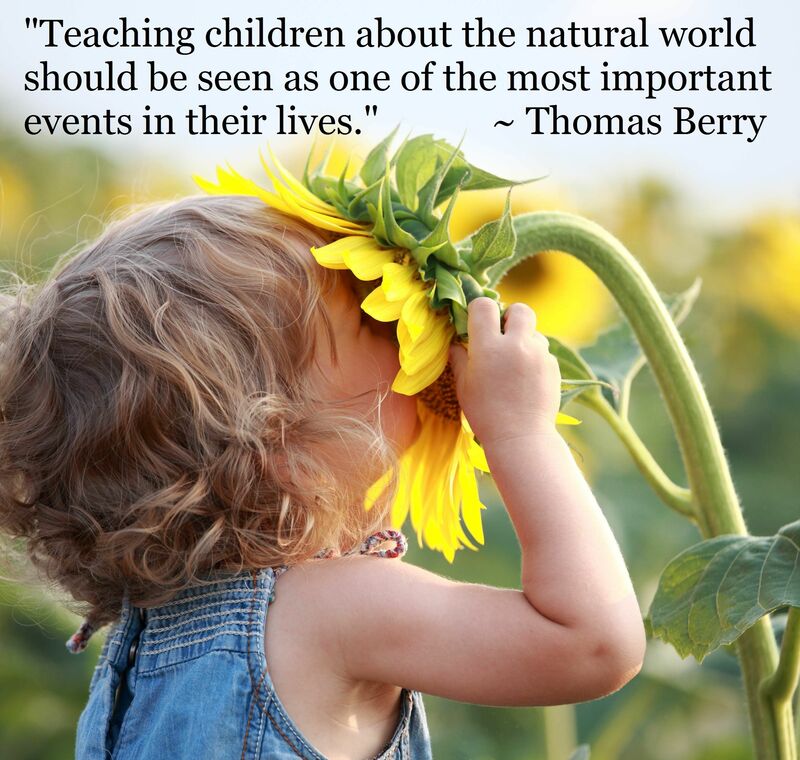 As a family, we look for opportunities to learn about our natural surroundings on day-trip adventures. I’ve recently discovered iNaturalist. Now I can upload all those photos of pretty flowers, and someone somewhere will identify them for me. From there, I can research how the local natural world might be useful (See Natural healing) now that my two main sources of Mexican home remedies, my mother-in-law and my husband’s grandmother, have died. I’ve learned how to make a tea for stomachaches, use aloe to aid in wound healing, dry feverfew and use agave. I have so much more to learn! Cave exploration outside of Cerano, GTO. 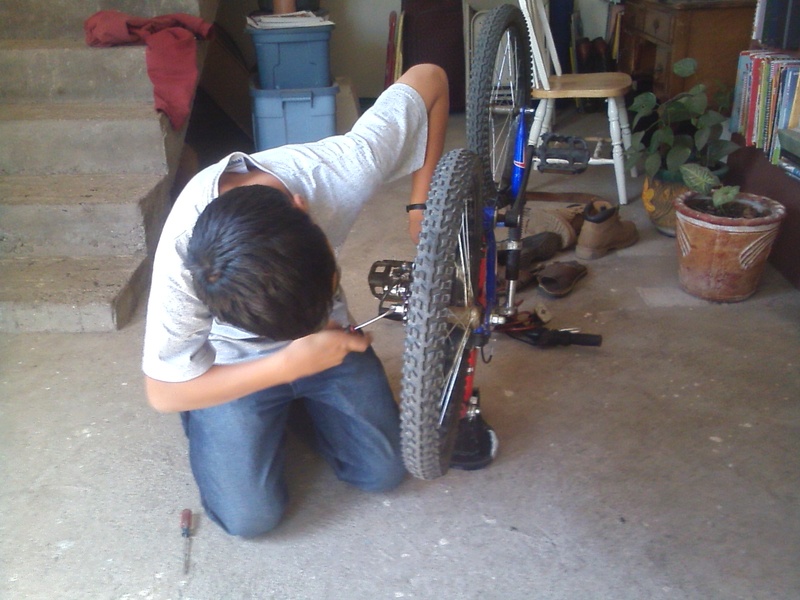 Because of our family philosophy, we encourage independent learning of our now 13-year-old son. He wanted to learn how to play soccer, we made sure that became a reality A few months ago, he asked if there were any teachers that I knew that could teach him Portuguese. I asked the Worldschoolers group on FB and was referred to Duolingo. My son has been regularly progressing through the beginning Portuguese course online. He uses it to chat with Brazilian Minecraft players. (See Hey Parents. What Minecraft is doing to your kids is kind of surprising) He thinks he might learn Vulcan after he finishes the Portuguese course. His most recent interest is in learning how to make Youtube videos. It isn’t an easy thing by any means and one that neither his father nor I can help much with. When an opportunity presented itself for him to make a video of his life (See What is it like to be a kid in your family? ) we purchased an inexpensive mini-camcorder and together made a video that his grandma in the United States is proud of! See it here! Our attitude has always been, if you don’t know how to do something, learn! No one is going to do it for you. 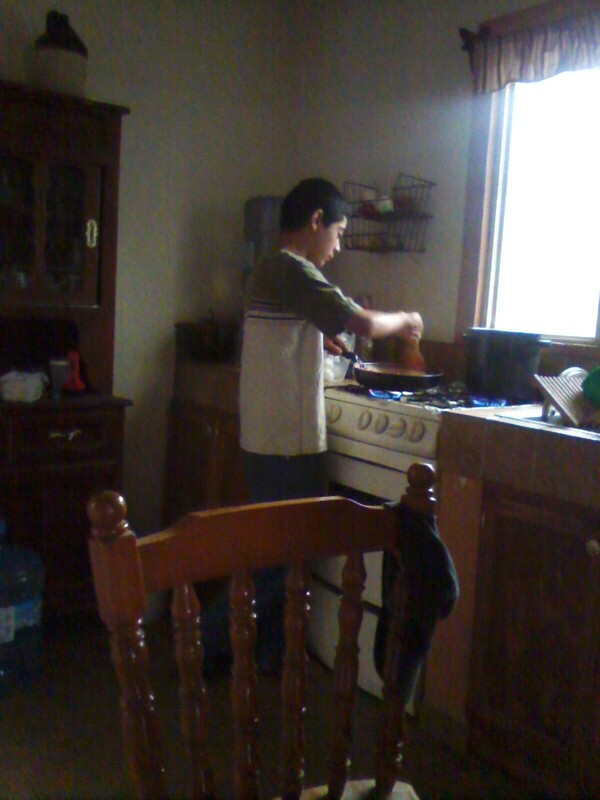 Skills that my son has learned at our side include bricklaying, cooking, bicycle repair, and gardening. However, we fully realize that my son needs more opportunities for learning than we can provide him. 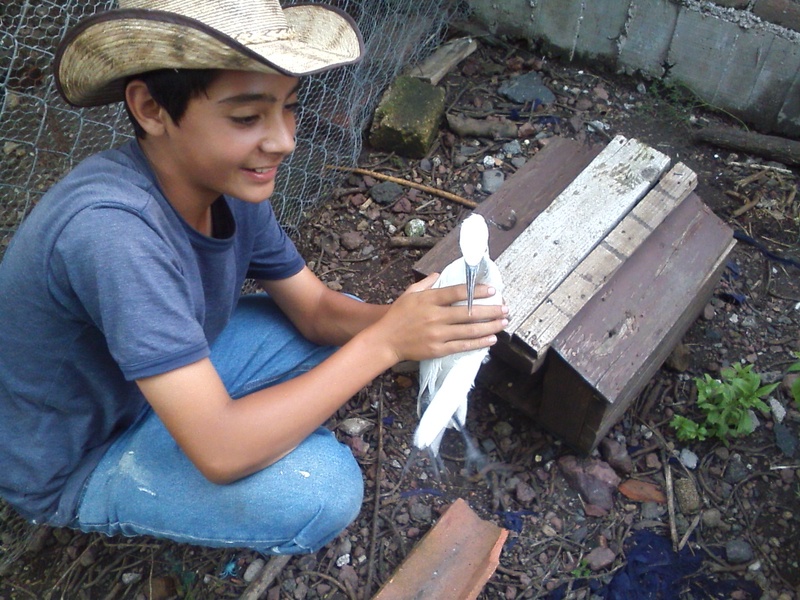 With this is mind, he attends the local middle school, where not only does his Spanish continue to improve, but he also is learning quite a bit about carpentry. So far he’s made a clothing rack and lidded box, quite useful items actually. We continually stress that even if he is soon to finish his formal schooling, there is no limit to the things he could learn. “I don’t know” is not an acceptable answer in our home. Is it in yours? The Financial Advice That Saved My Marriage — Shortly after they got married, Emily at Natural Parents Network and her husband visited a financial planner. Many of the goals and priorities they set back then are now irrelevant, but one has stuck with them through all of the employment changes, out-of-state-moves, and child bearing: allowances. Lifelong Learning — Survivor at Surviving Mexico–Adventures and Disasters writes about how her family’s philosophy of life-long learning has aided them. Inspiring Children to be Lifelong Learners — Donna from Eco-Mothering discusses the reasons behind her family’s educational choices for their daughter, including a wish list for a lifetime of learning. Always Learning — Kellie at Our Mindful Life loves learning, and lately she’s undertaken a special project that her family has been enjoying sharing with her. We’re all unschoolers — Lauren at Hobo Mama embraces the joy in learning for its own sake, and wants to pass that along to her sons as she homeschools. My children, my teachers — Stoneageparent shares how becoming a parent has opened doors into learning for her and her family, through home education and forest school. Never Stop Learning — Holly at Leaves of Lavender discusses her belief that some of the most important things she knows now are things she’s learned since finishing “formal” schooling. Learning is a Lifelong Adventure — Learning has changed over time for Life Breath Present, and she is more excited and interested now than ever before. Facebook: The Modern Forum — Dionna at Code Name: Mama explains why Facebook is today’s forum – a place where people from all walks of life can meet to discuss philosophies, debate ideas, and share information. 10 Ways to Learn from Everyday Life (Inspired by my Life in Japan) — Erin at And Now, for Something Completely Different offers tips she learned while living in Japan to help you learn from everyday life. Sometimes I worry that my son isn’t getting the education he deserves. We live in a rural area, he attends public school, but the education system is not the best, we don’t have regular access to the internet or public library, etc. But then he surprises me by discovering his passions on his own, and I look for ways to enhance his learning along with those lines, some formal, some informal. For instance, this summer my son was able to attend both music and art classes as part of a program I was coordinating for a school. While he didn’t learn to play an instrument in the music class, he did learn to listen. Now two months after the class ended, he still mentions how much he enjoyed it. He has me listen to songs the teacher introduced him to in class and talks about their music, meaning, and rhythm. In his art class, he learned how to create a chalk pastel and glue drawing, something I never would have thought to teach him. 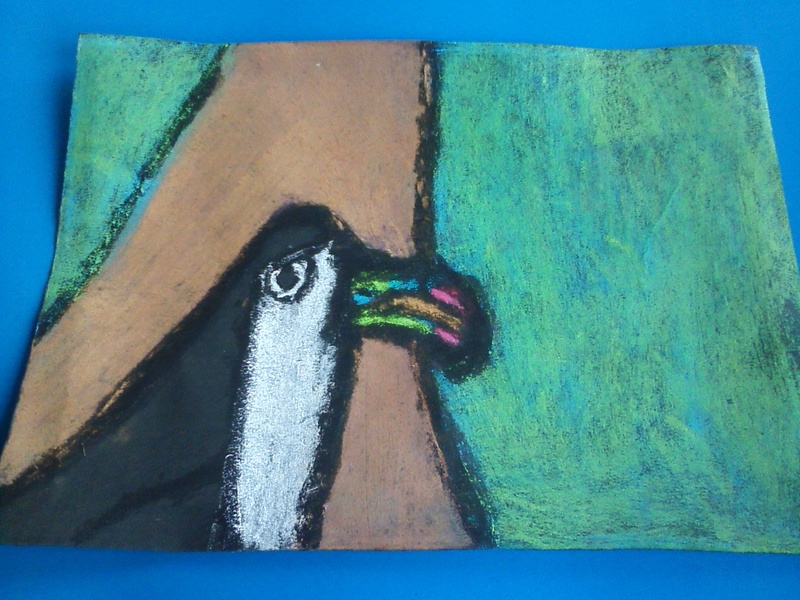 (To see how it’s done–Chalk Pastel and Glue Drawing.) 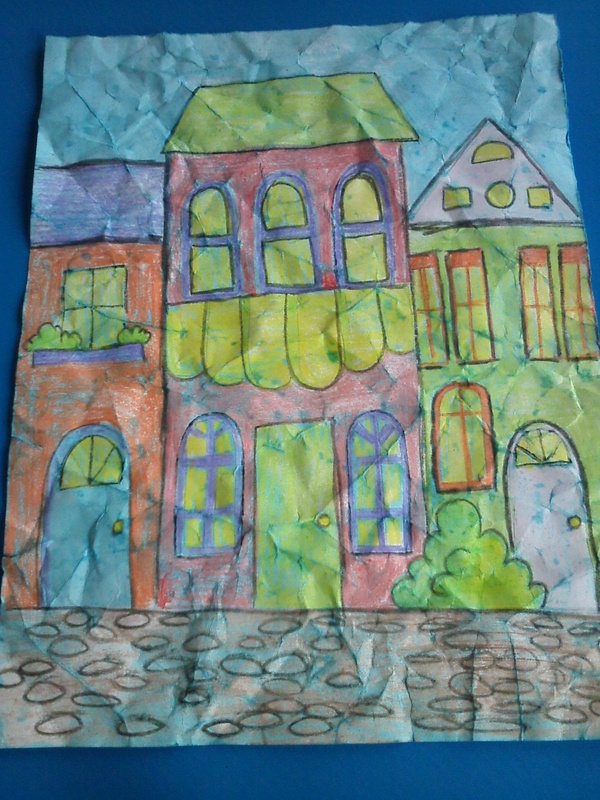 He also created a crayon batik drawing. Such exciting and fun art techniques! While I don’t believe he will necessarily become an artist, art is definitely part of a well-rounded education. As for informal learning, we had several geological adventures this summer. 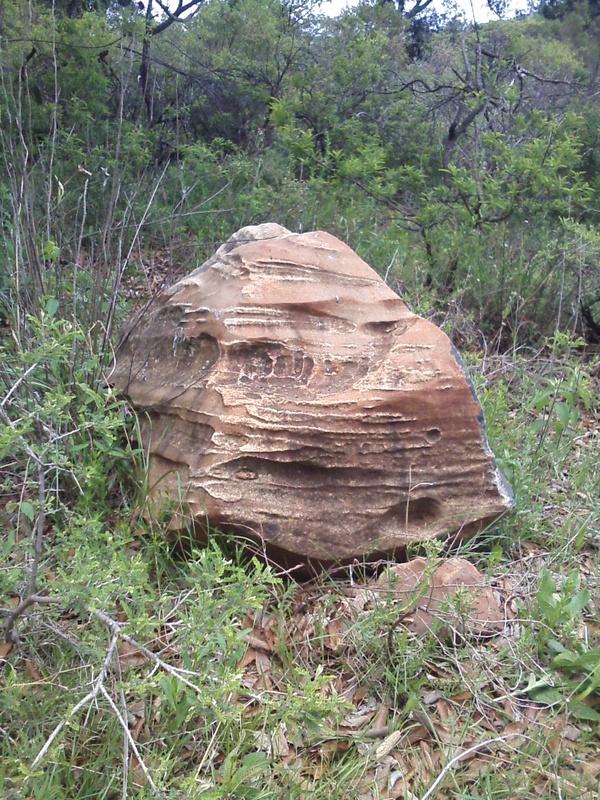 (See Las Cuevas en Cerano and Picking Capulines) My son found some incredible rock formations. Our little home library didn’t have much in the way of rock and mineral books, so I sent the pictures via email to an old college buddy who happens to be a geologist. He did an incredible write-up, complete with diagrams and highlighted areas, about the pictures. He sent links to geological studies of our area. My son was fascinated, also incredibly impressed by my friend’s rock knowledge, and learned something in the process. 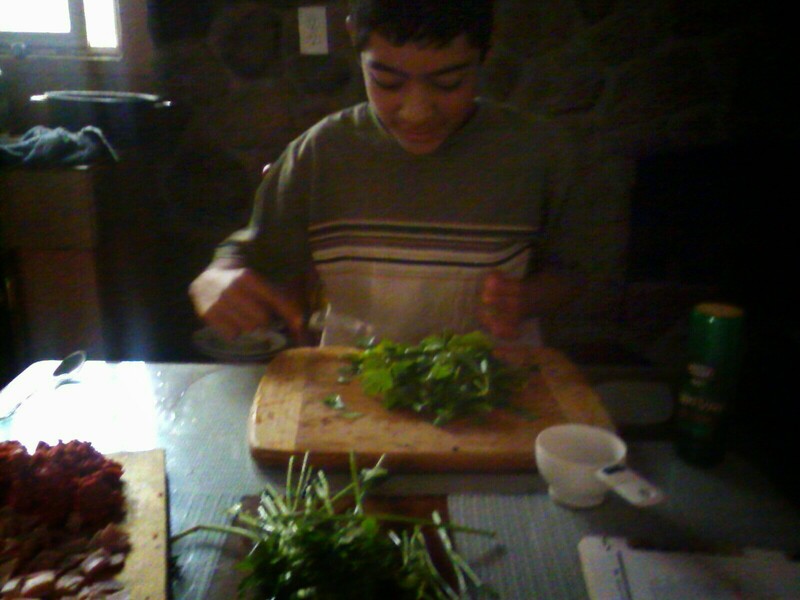 My son also expressed an interest in learning how to cook this summer. He asked if he could make something by himself, which was ok by me. He spent 2 days leafing through cookbooks until he found a dish that he felt he could make and that we could also find the ingredients for in our local market. 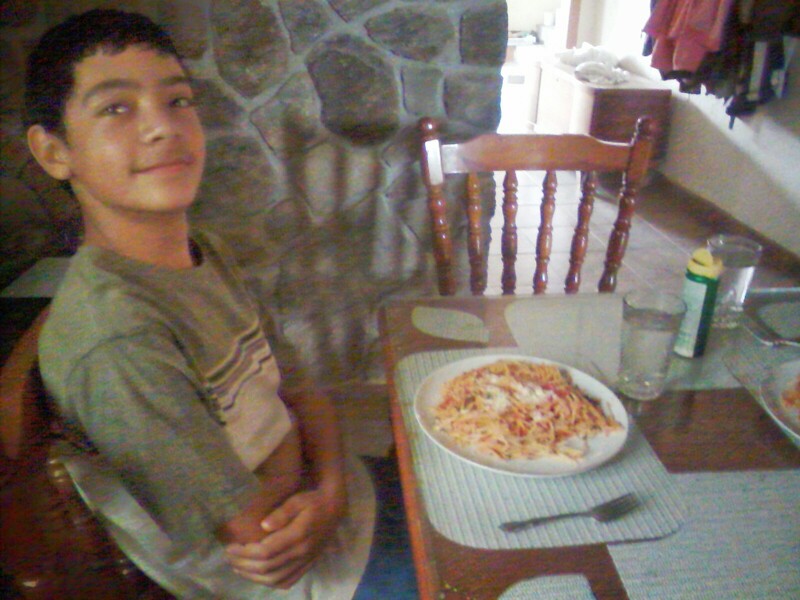 He chose spaghetti carbonara. He asked that I supervise, but not help. I was happy to oblige. We all enjoyed the result! Reading has always been an interest of his, however, his new phone, and subsequent game downloads distracted his focus a bit this summer. I had to change my tactics somewhat when I encouraged reading over games. If there were a book I wanted him to read, I would read it through first, and he would see me reading it and ask questions. I would only tell him the bare minimum, piquing his curiosity. When I finished the book, I left it in his room, seemingly by accident. Sure enough, he would pick it up and read it, usually in one long Sunday afternoon out with the goats. 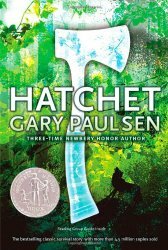 Two of books that he especially enjoyed this past summer were Bridge to Terabithia and Hatchet. My son also nursed an injured heron back to health. Our little guest stayed until its wing healed and then was on its way. 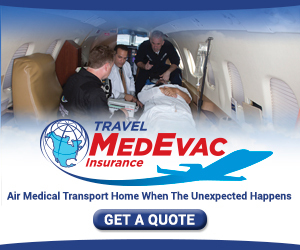 Take about a hands-on experience! Then he wanted to plant a flower garden in a little area that we haven’t had much luck in sowing. 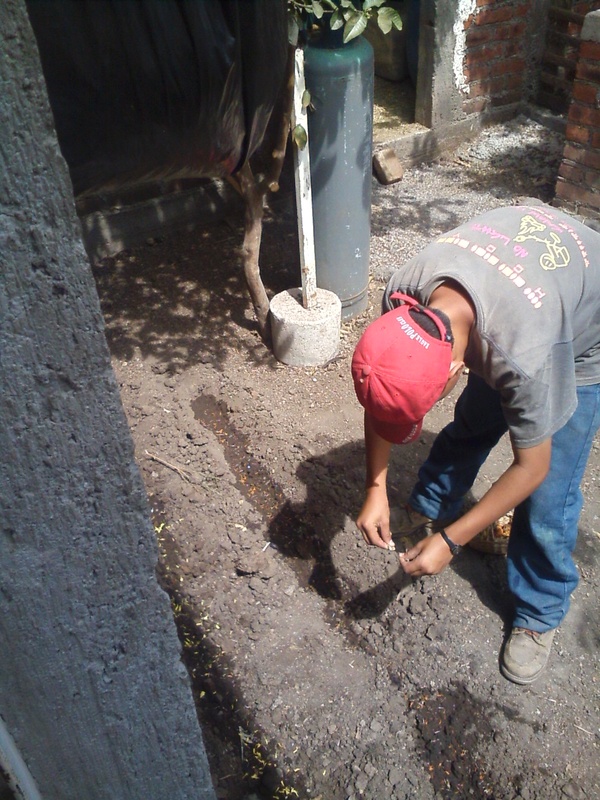 Again, he didn’t want any help, just the seeds and spent a happy afternoon planting. Unfortunately, the few plants that did sprout were quickly eaten by escaped chickens. Think it’s time to redesign the chicken area! The first day of Secondary! All too soon, the summer ended, and formal schooling began again, this time at what is known here in Mexico as secondaria (secondary). 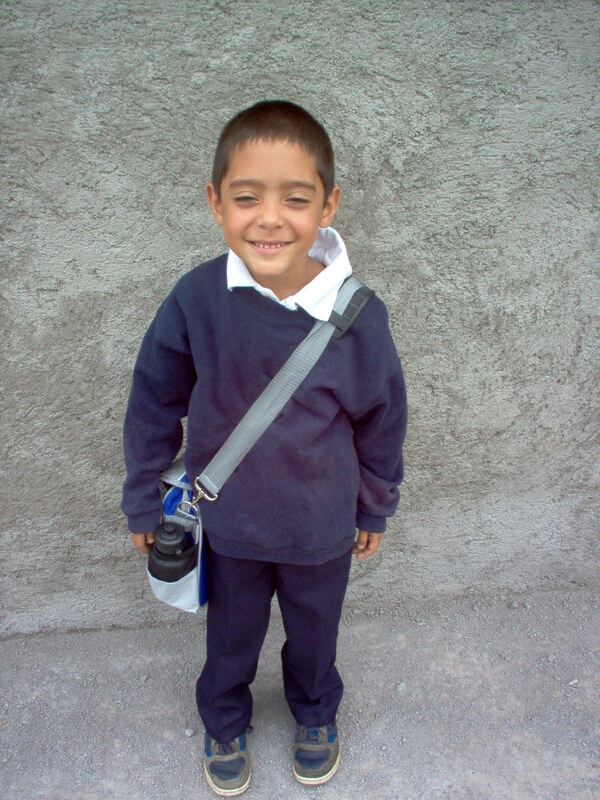 His hours in a structured classroom have increased from 4 to 6 per day. None of us are happy with the current schedule and have looked for alternatives, but have yet to find any that will work for us. Meanwhile, he does enjoy his biology class that is currently learning about the study of genetics (See Goat Genetics) and a woodworking class where so far he has made a complete set of stone-age tools and a doll’s table. 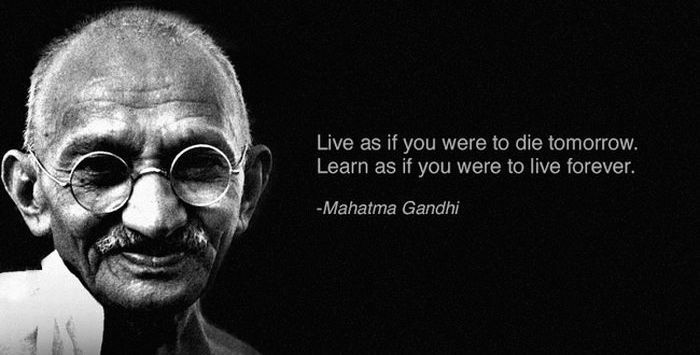 Learning, whether in a formal or informal setting, is essential to growth. It goes without saying that I want my son not just to grow, but to flourish. Sometimes that means creating an atmosphere for learning, and sometimes it means capitalizing on the environment that presents itself. And as Charlotte Mason writes …We know that parents and teachers should know how to make sensible use of a child’s circumstances (atmosphere) to forward his sound education; should train him in the discipline of the habits of the good life; and should nourish his life with ideas, the food upon which personality waxes strong. History of man must be taught as living history ( Who built this yacata? How did they live? Where did they go? ) or not at all. Last week, I had a look at my son’s 5th-grade calificaciones (grades) (See Alternative Homeschooling) and noticed that he had dropped considerably in the subject of Mexican history. How could this be? I asked myself. He is attentive and interested in the stories we discuss at home, the movies we watch, making endless speculation about why this person did this or acted like that and wonders continuously about our own place in the history of La Yacata, our small foundling community. I investigated further and looked over the questions he had missed. Well, that explained it then. This was dead history, no heroes, no battles, no significant achievements to remember. Is it less important for him to learn? Yes, I think so. In memorization dates and facts, he isn’t asked to make sense of what transpired, to understand the whys or hows of it all and as a consequence doesn’t learn history. 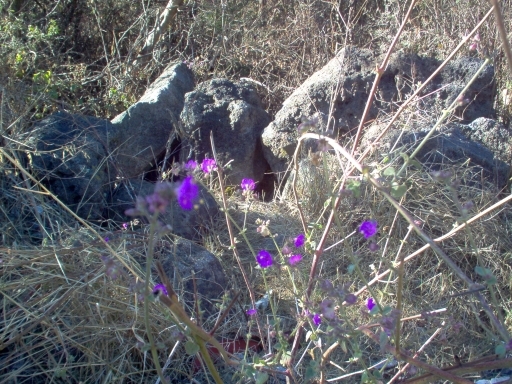 In contrast, in our very community, we have the La Yacata, a stone mound dating back to prehispanic Tarasco tribes. My son and I talk often about what it could have been built for, how the people in the region might have lived, what they might have eaten, such as pitayas, nopales, tunas, maiz y frijol (our typical diet), and the changes that came to the area as a result of Spanish invasion. So I am not upset at the lower grade when it means so little in the grand scheme of things. As this living way of examining history is lacking in the traditional classroom, it is up to me to make important events come alive in the mind of my son so that my he too may take his place in history, in our family history, in our community history, perhaps even in Mexican history or in the history of the world. So how can I, as a mother, provide these principles of conduct and a wide variety of fitting knowledge when the culture we live within is not my own? Should I insist on the behavior of my own culture from my child? Should I negate the culture surrounding us? Should I compromise rules of conduct because the cultural norms of both cultures are not mutually exclusive? The answer is: it depends. One example I mentioned before is that of the culturally permissible practice of lying in México. (See Parenting Challenge–Telling Truths). Lying is on my list of cardinal sins, but is so commonplace here that nothing spoken (or written) can be believed at full face value. So we compromise. Within our family, the rule is that we do not lie to one another, however outside the family circle, it is up to each member’s own reasoning ability whether to lie or not. Then there is the touchy subject of religion. México is predominantly Catholic. The laws are made by Catholics for Catholics. Anyone else outside that carefully maintained circle must fend for him or herself. This includes nearly universal instruction de la fe (of the faith or more specifically Mexican Catholic faith) that the majority of private schools include as part of their regular curriculum. Public schools have after-hour Catechism now because technically there is a separation of church and state by law, if not by practice. All of my son’s classmates at the public school he attends, also attend Catechism in preparation for their first communions. My son does not. (See Homeschool Variation). If his remaining unbaptized in the Catholic faith makes him like the animals (as his grandmother repeatedly told him) then so be it. He and I are animals. Conventional religious instruction should not be confused with faith which can include any number of religions. We talk in our family openly about faith and what it can and can not do and how it is different from religion. So how do we navigate these tricky waters? By taking them one issue at a time. (See Parenting Challenge–When someone dies). Each unexpected disaster, each surprising wonder is an opportunity for us to discuss as a family what it means to have faith and what faith looks like, for us and for those around us. (See Carnival, Lent, Pilgrimages). So my task as a mother and educator for my son is to develop his reasoning abilities through a broad spectrum of lessons and experiences. (See Parenting Challenge–Creating an Atmosphere for Education) Beyond the English grammar worksheet in the morning and the Mexican history lesson in the afternoon, there are other lessons to learn. Sometimes these lessons are through his own studies (See Parenting Challenge–Education as a Discipline) and sometimes they are incidental. (See Parenting Challenge–Conformity and Education, Parenting Challenge–Cultural Apathy). And I continue to work at this because I firmly believe that the function of education is not to give technical skill but to develop a person; the more of a person, the better the work of whatever kind; and who doesn’t want his or her child to become a whole person? It is my hope, that even though the laws in this country prove without a doubt that no wrong thing has ever been done or said, no crime committed but has been justified to the perpetrator by arguments coming to him involuntarily and produced with cumulative force by his own reason that my son can develop his own reasoning to find his own way as he travels through life. Since once we are convinced of the fallibility of our own reason we are able to detect the fallacies in the reasoning of our opponents and are not liable to be carried away by every wind of doctrine or custom.